I have been thwarted this week in my pursuit of gardens. While September ended in morning mists, October has washed in with gloom and rain. I guess that's the problem with this time of year and the main reason why I don't venture out into my garden much between now and March. I know though that it's not a time to sit back as there are still a few jobs to be done. So let's get on with what needs doing. Rake up leaves – The wind and rain has meant even more leaves have fallen in recent days. I know it's difficult when they look so pretty but rake them up to make your own leaf mold. If you have a lawn try raking them into the lawn or mowing them in if the weather allows. Turn the compost heap – The colder weather means the rate of decomposition slows down. Get plenty of air in by turning or moving around what's in your bin. Divide rhubarb – Don't be tempted to pick any stalks for eating now. The plant needs the oxalic acid from the leaves to help it grow again next year. Instead think about dividing any big clumps. Just make sure that each of the separate crowns have a large bud each. Harvest apples, pears and nuts – Some varieties of apples don't store well so if you know your apples aren't keepers think about making apple pies to freeze. Use a combination of apples and pear to make a winter chutney. For other varieties pick any that aren't bruised or blemished and then wrap in newspaper. Put in a tray or box with some holes in so the air can circulate. Pears though are best stored unwrapped. If you have any hazelnuts, cobnuts or filberts then keep them in a cool,dry container again with air holes. Regularly turn them to stop them sweating and going mouldy. Collect and dry seeds – Before pulling up any old plants check for a missed pod or fruit that could contain a bean or seed. Make sure the seed is fully dried before storing and use paper packets or envelopes to store them. Don't forget to label them or you'll be trying to germinate mystery plants next year! Order seeds for next year and get some end of season bargains – One of the best ways to spend the dark nights is to start planning for next year. Gather up your stack of seed catalogues and make notes of what you want to grow next year. Don't forget to take advantage of the end of season sale of seeds. I've seen some packets on sale for as little as 10p. Many of these packets will still have next year's date on. Replace summer container plants – If you want some winter life and colour clear out the old plants and re-pot with winter pansies, mini conifers, cyclamen and heathers. Keep an eye on early frosts and protect vulnerable plants – Don't lose your plants to frost attacks. Instead take them inside your house or greenhouse. Alternatively think covering with fleece. Feed the birds – I feed the birds all year round but come autumn many of the wild berries and seeds they have been feasting on have gone. 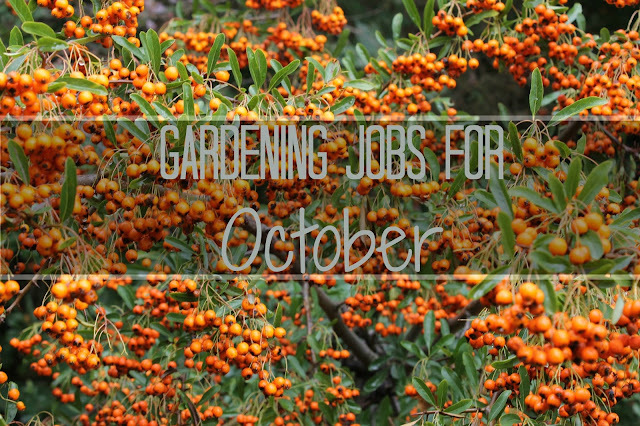 What jobs have you got to do in October? A great list of jobs for the garden! Super list of things to do. I have bought some autumm plants to redo the pots at the front of the house this weekend, a good mix of pansies, cyclamen, heathers and ornamental cabbages. I gathered some hollyhock seed this week and felt so pleased with myself - free plants next year. A handy list oh jibbery jabbery one! Grandad'so back garden backs into a copse off the biggest trees and he can spend whole days raking leaves at this time of year and burning them,a never ending job there! I have bought daffodil bulbs this week in a moment of unheard of organisation. You must all be rubbing off on me!!! We have had one sneaky frost here that arrived unannounced (thank you NOT Méteo France) but I think my tender plants were OK and I made sure I harvested all the pumpkins later that same day. It was thankfully on very slight but a frost all the same. So frost watch is certainly something on my To Do List.